Palusa, S. G. and Reddy, A. S. (2013). Analysis of RNA-protein Interactions Using Electrophoretic Mobility Shift Assay (Gel Shift Assay). Bio-protocol 3(22): e967. DOI: 10.21769/BioProtoc.967. RNA binding proteins (RBPs) play a crucial role in regulating gene expression at the post-transcriptional level at multiple steps including pre-mRNA splicing, polyadenylation, mRNA stability, mRNA localization and translation. RBPs regulate these processes primarily by binding to specific sequence elements in nascent or mature transcripts. There are several hundreds of RBPs in plants, but the targets of most of them are unknown. A variety of experimental methods have been developed to identify targets of an RBP. These include RNA immunoprecipitation (RIP), UV cross-linking and immunoprecipitation (CLIP) and many variations of CLIP (e.g. PAR-CLIP, iCLIP). These approaches depend on immunoprecipitation of RNAs bound to a specific RBP using an antibody to that RBP. Electrophoretic mobility shift assay (EMSA), also called gel shift assay, has been used to analyze protein-nucleic acid interactions. It is a simple and powerful method to analyze protein-RNA/DNA interactions. In RNA EMSA, RNA-protein complexes are visualized by comparing the migration of RNA in the presence of a protein. Generally, in RNA EMSA a specific RNA sequence is used to analyze its interaction with a protein. In vitro transcribed 32P labeled or chemically synthesized RNA with a fluorescent tag is incubated with or without the protein of interest and the reaction mixture is then run on native polyacrylamide gel electrophoresis. RNA-Protein complexes migrate slowly as compared to free RNA, which can be visualized using an imaging system. In addition to test binding of an RBP to RNA, EMSA is also used to map the region in RNA and/or protein that is involved in interaction. Furthermore, the binding affinity can also be quantified using EMSA. Note: All work should be done in an RNase free environment, using only sterile, RNase free solutions and materials. Note: We routinely produce RNA probes by in vitro transcription using a linearized pGEM clone that contains the DNA corresponding to RNA of interest. pGEM vector has T7 and SP6 promoters. Depending on the orientation of insert DNA either T7 polymerase or SP6 polymerase is used in in vitro transcription to generate RNA probe. Prepare the following reaction in a 1.5 ml of microcentrifuge tube. 1 μl DNA template (~ 1 μg of linearized plasmid DNA), 1 μl 10x RNA polymerase buffer, 1 μl rNTPs (5 mM ATP, CTP, 0.5 mM GTP, UTP), 1 μl cap analog (5 mM), 4.5 μl (45 μCi): a-32P-UTP (800 Ci/mmol; 10 mCi/ml), 0.5 μl RNase Inhibitor, and 1 μl SP6 polymerase a total of 10 μl of reaction. Incubate 37 °C, for 3 to 6 hours (Note 1). Add 90 μl dH2O to 10 μl total 100 μl. Add equal volume of (100 μl) of phenol/chloroform, mix by vortexing. Spin at 16,000 x g for 5 min. Transfer upper layer into a new Eppendorf (~100 μl). Add 33 μl 10 M ammonium acetate and 250 μl 100% ethanol to the 100 μl. Incubate at -80 °C for 10 min. Spin at 16,000 x g for 10 min. Wash the pellet with 500 μl of 80% ethanol. Air dry the pellet; resuspend in 10 μl RNA loading dye. Heat 1 min at 90 °C. Load on 5% denaturing acrylamide gel and run for one to two hours depending on the size of RNA (Note 2). Disassemble the gel chamber and dismantle the gel, leaving it mounted on one plate. To facilitate the alignment of the gel to the X-ray film in stepA16 below, cut one corner of the gel. Wrap the gel with Saran wrap to avoid contamination. Expose the gel to an X-ray film for 2-5 min and develop the film to visualize radioactive bands. Align the gel on top of the X-ray film and locate the region in the gel corresponding to the radioactive band on the film. 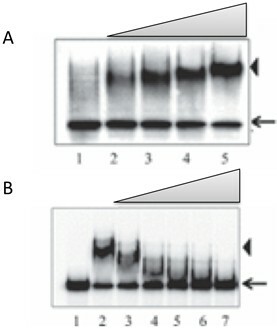 Excise the gel corresponding to the band on the X-ray film (see Figure 1 and Notes 3 & 4). Figure 1. In vitro transcribed RNA used in Figure 2a and 2b. 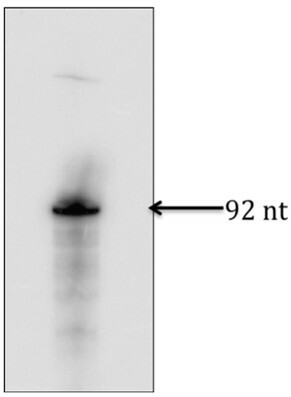 After exposing the gel to an X-ray film, identified the right size of RNA product, excised the gel corresponding to the band and used to extract RNA. Transfer the excised band to 400 μl of TNS solution in an Eppendorf tube and incubate overnight at room temperature. Next day, take out TNS solution, which contains radiolabelled RNA and add equal volume of phenol/chloroform, mix by vortexing. Dry the pellet; resuspend the RNA pellet in 20 μl H2O. Measure radioactivity in1 μl of RNA using liquid scintillation counter and use this number to calculate concentration of labeled “U” residues in RNA probe (Note 5). Dilute RNA probe with RNase free water to 50 to100 K cpm/μl for use in EMSA assays. For EMSA analysis apart from RNA a purified protein of interest is needed. One can generate this protein by cloning the cDNA into a bacterial expression vector. Here we expressed SR45 in E.coli as an S.tag fusion and purified it using S-protein agarose beads. Grow E. coli BL21 (DE3)-pLysS host cells harboring SR45 cDNA in LB medium containing ampicillin at 37 °C for overnight. Next day inoculate 1 ml of overnight culture into 100 ml of LB medium containing appropriate antibiotic, then grow culture until OD600 reaches ~0.6 (it will take approximately 2 h). Induce expression of recombinant protein by adding IPTG to a final concentration of 0.5 mM and allow the bacterial culture to grow for an additional 4 h at 30 °C. Harvest bacterial cells by centrifugation at 2,350 x g for 10 min at 4 °C. Discard the supernatant and resuspend the cell pellet in 1/10 culture volume (5 ml) of 50 mM Tris-HCl pH 8.0, 2 mM EDTA. Add lysozyme to a concentration of 100 μg/ml; use a 10 mg/ml stock freshly prepared in 50 mM Tris-HCl pH 8.0, 2 mM EDTA. Then add 1/10 volume (0.5 ml) of 1% Triton X-100. Incubate at 30 °C for 15 min. Place the tube in an ice bath and sonicate 4 times (at 3.5 setting) for 15 sec/each time. Centrifuge at 12,000 x g for 15 min at 4 °C. The supernatant contains soluble proteins. Filter the supernatant through a 0.45 micron membrane. Add 100 μl of binding/wash buffer to 100 μl of S-protein Agarose slurry in an Eppendorf tube and mix it gently, then add 1 ml of soluble proteins from step 8 (Note 6). Mix and incubate at room temperature on an orbital shaker for 30 min. (Do not shake vigorously as this may denature protein). Centrifuge at 500 x g for 10 min at 4 °C and carefully decant supernatant and wash the beads with five times, 1 ml each time, with binding/wash buffer. Resuspend the washed beads containing the bound protein in 150 μl of the 0.2 M citrate buffer, pH 2. Incubate for 10 min at room temperature, mix gently every few minutes. Neutralized by adding 8 μl 2 M Tris-base (pH 10.4). The eluted proteins were dialyzed against phosphate buffer (Note 7). Before setting up the reaction, prepare 5% non-denaturing (native) gel, and pre-run the gel at 200 V using 1x TBE buffer for 10 to 15 minutes. Prepare the following reaction mixture (final volume 14 μl) in a 1.5 ml of microcentrifuge tube. 1.5 μl of 1 mM spermidine (100 mM), 3 μl of 5x gel shift buffer, 0.5 μl of RNase Inhibitor, 1 μl of radiolabel RNA (50-100 K cpm), x μl lysis buffer (depending on protein volume) and x μl of protein of interest (Note 8). Incubate at 30 °C for 5 min. Add 1 μl of Heparin Sulfate (50 mg/ml) (Note 9). Transfer the reactions to ice for 5 min. Add 3 μl 6x urea free loading buffer. Load the reaction products on 5% non-denaturing gel and run at 200 V for 2 to 3 h or as long as necessary for good separation (normally we will run 2 h for RNA probe that is about 200 nt) (Note 10). Transfer the gel to Whatman filter paper, cover with Saran wrap, and dry with a gel-drying apparatus. The dried gel should be exposed to the phosphorimaging screen for 2 h to overnight. Free RNA and RNA – Protein complex(es) are visualized by using phosphorimager (see Figure 2a and 2b). Figure 2. RNA EMSA. A. EMSA with an RNA probe using a purified recombinant protein. Lane 1, free probe; lanes 2-5, increasing concentration of recombinant protein. B. Binding of recombinant protein to RNA probe is competed by cold RNA. Lane 1, free probe; lane 2, probe + recombinant protein; lanes 3-7, as lane 2, with increasing concentration of cold RNA. Arrows indicate free probe, and the RNA-protein complex is indicated by arrowheads. After confirming the binding of a protein with a specific RNA target using EMSA, the specificity of interaction can be tested by competition studies in the presence of excess amount of same RNA that is not labeled. Increasing amount of competitor RNA (up to 100x of labeled RNA) is added to the binding reaction mixture and the ability of the cold competitor RNA to disrupt the complex is determined as above using native gel electrophoresis (see Figure 2b). Unlabeled competitor RNAs is generated in the same manner as above (see A section), except that the amount of cold UTP is increased to 5 mM and the amount of radioactive UTP is reduced to 0.045 μCi. Three hours of incubation yields good amount of RNA. For ~100 base long RNA probe run the gel for 1 h; for 200 to 300 nts long probe run the gel for two to three hours. It is important to run in vitro transcribed RNA on a denaturing gel to confirm that the right size product is generated. The correct size band should then be excised and purified. Sometimes RNA templates yield two or more RNA products due to its secondary structure. If this happens, excise only the correct size band for purification. Concentration of labeled “U” in RNA is calculated using the specific activity of radiolabeled UTP, final concentration of UTP (radiolabeled UTP plus cold UTP) in the reaction and the number of “U” residues in the template. (fmoles of RNA = fmoles of UTP in the RNA probe/number of "U" residues in the labeled RNA). Since the amount of protein in soluble fraction varies depending on the clone and expression level, it is necessary to optimize the ratio between agarose beads and the protein. The recombinant protein should be purified to near homogeneity and protein concentration should be determined. It is not advisable to use crude extract from bacteria expressing recombinant protein. Always use a known concentration of RNA probe and increasing concentration of protein. Heparin sulfate reduces non-specific binding of RNA probe to proteins and eliminates background. Running time of native gels is dependent on the RNA and protein complex, it must be optimized for each RNA and protein. For longer run times, gels must be run at 4 °C temperature. Smaller size RNA probes (from 50 to 200 nts) work well in RNA EMSA. If some RNA/protein complex stays in the well, add BSA to minimize this effect. The concentration of RNA and protein should be optimized for each RNA-protein complex. Approximately 100,000 cpm of RNA and 500 ng of protein is a good starting point for binding studies. Note: All buffers should be prepared with RNase free water. This protocol was adapted from Thomas et al. (2012). This work was supported by a grant from the US National Science Foundation. Day, I. S., Golovkin, M., Palusa, S. G., Link, A., Ali, G. S., Thomas, J., Richardson, D. N. and Reddy, A. S. (2012). Interactions of SR45, an SR-like protein, with spliceosomal proteins and an intronic sequence: insights into regulated splicing. Plant J 71(6): 936-947. Golovkin, M. and Reddy, A. S. (1999). An SC35-like protein and a novel serine/arginine-rich protein interact with Arabidopsis U1-70K protein. J Biol Chem 274(51): 36428-36438. Palusa, S. G. and Wilusz, J. (2013). Approaches for the Identification and Characterization of RNA-Protein Interactions. Biophysical approaches to translational control of gene expression, Biophysics for the Life Sciences, J. D. Dinman (eds). Springer: 199-212. Ryder, S. P., Recht, M. I. and Williamson, J. R. (2008). Quantitative analysis of protein-RNA interactions by gel mobility shift. Methods Mol Biol 488: 99-115. Thomas, J., Palusa, S. G., Prasad, K. V., Ali, G. S., Surabhi, G. K., Ben-Hur, A., Abdel-Ghany, S. E. and Reddy, A. S. (2012). Identification of an intronic splicing regulatory element involved in auto-regulation of alternative splicing of SCL33 pre-mRNA. Plant J 72(6):935-946. Wilusz, J. and Shenk, T. (1988). A 64 kd nuclear protein binds to RNA segments that include the AAUAAA polyadenylation motif. Cell 52(2): 221-228. How to cite: Palusa, S. G. and Reddy, A. S. (2013). Analysis of RNA-protein Interactions Using Electrophoretic Mobility Shift Assay (Gel Shift Assay). Bio-protocol 3(22): e967. DOI: 10.21769/BioProtoc.967. Hi, I am experiencing signal on the well position. Notes 12 recommends to use BSA to minimize it, but how about the concentration of BSA to improve the issue? Thank you in advance. we normally use 100ug/ml final concentration of BSA for this, but based on your conditions you have to optimize this. Not exceed more than 15ul of loading volume, if you increase the loading volume, you are increasing the salt concentration and this will effect on PH and finally it will create problem on running condition. If possible add 1 ul tRNA in addition Heparin sulfate. Is there any big difference between DNA-EMSA and RNA-EMSA based on your experience? I'm doing some RNA-EMSA exp. as screening and not that successful so far. I need to confirm that this result come from no interaction between RNA sequence and protein or my procedure problem. Sorry to take so long to get back to you. Your above question seems to be a kind of general question. We would suggest that more specific question/comment related to this protocol could be addressed more effectively by our authors or other experts. Do you have any experience with poly[dI-dC], instead of heprain sulfate? poly[dI-dC] commonly used in DNA-EMSA & I just wonder whether it could work in RNA-EMSA or not. Or is there any specific reason to use heparin sulfate?" we never used poly[dI-dC] for RNA -EMSA, since five years we are using heparin sulfate and it is working very well. Heparin sulfate used for reduce the non specific binding like poly[dI-dC] in DNA-EMSA. Or is there any specific reason to use heparin sulfate? Please see Prof. Palusa's response to your question above.